Art and China after 1989 presents work by 71 key artists and groups active across China and worldwide whose critical provocations aim to forge reality free from ideology, to establish the individual apart from the collective, and to define contemporary Chinese experience in universal terms. Bracketed by the end of the Cold War in 1989 and the Beijing Olympics in 2008, it surveys the culture of artistic experimentation during a time characterized by the onset of globalization and the rise of a newly powerful China on the world stage. 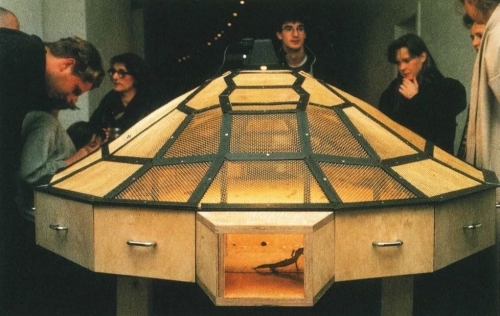 The exhibition’s subtitle, Theater of the World, comes from an installation by the Xiamen-born, Paris-based artist Huang Yong Ping: a cage-like structure housing live reptiles and insects that coexist in a natural cycle of life, an apt spectacle of globalization’s symbiosis and raw contest. For art and China, the year 1989 was both an end and a beginning. The June Fourth Tiananmen Incident signaled the end of a decade of relatively open political, intellectual, and artistic exploration. It also marked the start of reforms that would launch a new era of accelerated development, international connectedness, and individual possibility, albeit under authoritarian conditions. Artists were at once catalysts and skeptics of the massive changes unfolding around them. Using the critical stance and open-ended forms of international Conceptual art, they created performances, paintings, photography, installations, and video art, and initiated activist projects to engage directly with society. Their emergence during the 1990s and early 2000s coincided with the moment the Western art world began to look beyond its traditional centers, as the phenomenon of global contemporary art started to take shape. Chinese artists were crucial agents in this evolution. Art and China after 1989 is organized in six chronological, thematic sections throughout the rotunda and on Tower Levels 5 and 7. For all the diversity the exhibition encompasses, the artists here have all sought to think beyond China’s political fray and simple East-West dogmas. This freedom of a “third space” has allowed for a vital distance, and a particular insight, as they contend with the legacies of Chinese history, international modernism, and global neoliberalism of the 1990s. Their rambunctious creativity can expand our ever-widening view of contemporary art and inspire new thinking at a moment when the questions they have faced—of identity, equality, ideology, and control—have pressing relevance.